This meal is all sorts of happiness. It'll make you feel all warm and fuzzy inside, like a just out of the oven batch of chocolate chip cookies. Only, err, it's dinner. 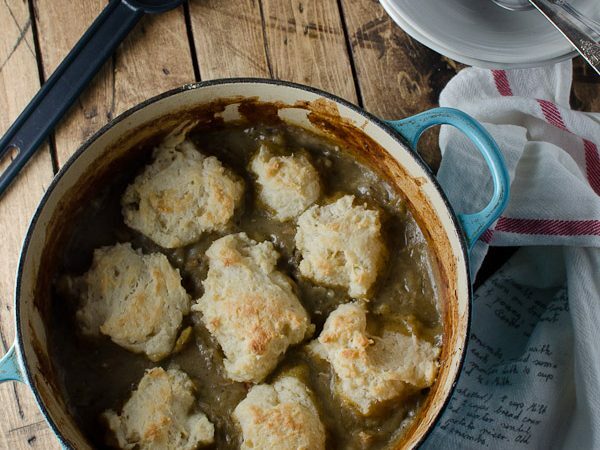 You'll want to eat a big pot of this creamy chicken stew with dumplings when it's rainy and cold outside. By the fire. In your pajamas. On one of those it's-supposed-to-be-spring-but-it's-still-fricken-cold-outside days. Ya, you know the ones. It's one of those days here in Vancouver and this stew is making winter's last grip on the city a little more bearable. That's a face that would never lie to you. He's the friendliest 4 legged furry creature on the planet. No joke. He meets friends everywhere he goes, isn't afraid of anything but being alone and wants nothing more out of life than to be loved by everyone. He's like a puppy trapped in the body of a cat. Aaannnd … now that you're all thinking I'm a crazy cat lady, let's chat about this chicken stew again. I've only just started making stews and can't believe how easy they are. Even with the biscuits this whole thing came together in about 45 minutes, and most of that was hands off time. By the time the pot came out of the oven I had all the dishes done and a glass of wine in my hand. Now that's my kind of dinner! You are going to absolutely love this Creamy Chicken Stew with Dumplings recipes on a cold winter day. It's the perfect comfort food and super easy to make. Melt the butter in a large pot over medium high heat. Add the onion and cook for 5 minutes. Add the chicken thighs and cook for 5 minutes more, stirring often. Add the potatoes, carrots, celery, poultry seasoning, sea salt and fresh creaked pepper and stir well to combine. Add the chicken stock and bring the pot to a boil. Reduce the heat, cover the pot, and let it simmer for 15 minutes, or until the potatoes are soft. Whisk together the flour and dry white wine. When the potatoes are soft pour it into the pot and bring the pot to a boil. Let the pot simmer for 1-2 minutes, or until it has thickened. Remove the pot from the heat and stir through the cream cheese. Drop the dumpling dough in spoonfuls over top of the stew. Place the stew in the oven and broil it on the centre rack for 15-20 minutes, or until the dumplings are cooked through and light brown on top. Remove from the oven and let it sit for 5 minutes before serving it. Preheat the oven to broil at 420 degrees. Add the flour, baking powder and sea salt in the bowl of your food processor and pulse to combine. Add the cold butter run the food processor until the mixture resembles course sand. Pour the flour mixture into a medium sized bowl and add the buttermilk all at once and stir until just combined. Place the bowl in your fridge. I loved the recipe, but I found the cream cheese over powering. Next time will put half of what I put in it or not at all because it was already thick and delicious without it. I only recently started making stew as well and couldn’t believe how simple it was to prepare! The cooking time can sometimes take long depending on the type of meat used, but this one is fairly quick. I’ll be sure to try chicken instead of beef next time for a change!